The Westbrae Neighborhood of Berkeley, at the crossroads of Gilman and the Ohlone Greenway, is a perfect kid-friendly destination for a sunny day. Plays and playdates for kids in the Bay Area this March: donuts, gymnastics, ping pong, science, Easter bunny, and more! Tahoe is a popular summer vacation spot among Bay Area locals. Make the trip with kids more manageable with these favorite roadside destinations. The Montclair Park in Oakland is a fantastic park for kids of all ages. There are two playground areas for different ages and both are clean. What to do in February with Bay Area Kids: Celebrate lunar new year, Valentine’s Day and 26 more ideas! 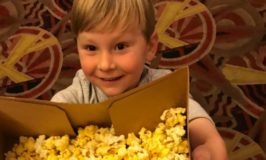 $5 Tuesday movie showings for kids and families around the East Bay. You can swim in the New Year then spin, bounce, play, hike, and dance all the other days. Here’s where to do it all this month. Alameda’s South Shore Center’s newest addition – Adventure Court Playground – is a win for all. A perfect pit stop after you’ve shopped. Your train-obsessed children are going to love this adventure to the California Railroad Museum in Sacramento from Berkeley by railroad. So much fun all month long — find Santa, play in the snow, listen to stories, see lights, get crafty, head to the drive-in, take in a show, phew!